Question: You’ve mentioned that you’re a big fan of wild brook trout. What’s your favorite pattern for mountain brookies? Answer: The best trout waters near my office in southwestern Vermont are fast-flowing freestone streams, which feature lots of pocket water, so I need a high-floating fly that I can see even in frothy, turbulent water. In creating the Hi-Vis Coachman, I copied aspects of the traditional Royal Coachman, the Hi-Vis Royal Wulff, and the Comparadun to create a fly that’s tough to sink and hard to miss, even in low light. In fast water, fish don’t seem to mind the garish colors, and I’ve taken many fine brookies and brown trout on the Hi-Vis Coachman. I also tie the pattern in yellow, chartreuse, and white. Hook: Standard dry-fly hook, sizes 6 through 20. Wing: Orange deer hair, tied Comparadun-style. Hackle: Grizzly, clipped flat along the bottom of the fly. Body: Four or five wraps of peacock herl, followed by a short section of red thread or floss, then another three or four wraps of peacock herl. 1. Clean and stack a clump of orange deer hair, and tie it in about 1/4 of the way behind the hook eye. Stand the hair upright by wrapping a dam of thread directly in front of the clump. The wing should be about as long as the hook shank. 2. 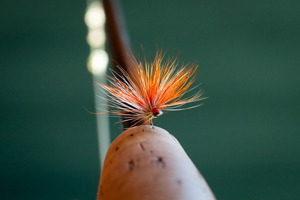 Attach a grizzly dry-fly hackle behind the wing, and wrap the thread back to the hook bend. 3. Clean and stack a small clump of orange deer hair, and tie it in at the hook bend. Directly in front of the tail, tie in a strand of peacock herl. 4. Wrap the thread forward, make four or five wraps of peacock herl, and tie it off. Wrap a smooth layer of thread or floss, and then make another herl section the same way you made the first one. 5. Bring the thread forward to the hook eye. Wrap the hackle several times behind the wing, and then several times in front. Tie off, whip-finish, and apply head cement. 6. After the head cement has dried, clip the hackle flat along the bottom of the fly, and stroke the deer hair into a half-moon shape.